The XLPE-insulation possesses very good electrical, mechanical and thermal characteristics in medium voltage networks. This type of insulation has excellent chemical resistance and is also resistant to cold. Due to various advantages, the XLPE insulated type has vastly displaced the traditional classical paper insulated types in many sectors. 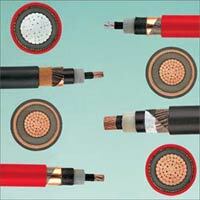 The XLPE-insulated medium voltage cables are designed with longitudinally water-proof. In comparison to PVC and paper-insulated cables, the advantage of XLPE-insulated medium voltage power cables is that it possesses a low dielectric factor. The good properties of XLPE-insulated cables remain constant at a long temperature range. These cables can be laid in ground, in air or in tubes. Further information for laying, bending radius ambient temperatures, permissible tensile strength with pulling head test voltages should be taken in the following pages.